Observant keepers may notice that their gecko’s throat, cheeks and jowls puff out from time to time. The reasons for the action are varied; most are no cause for concern. But if mucus or fluids are present, the gecko may have a respiratory infection. However, in most cases, throat puffing is related to shedding, breathing, social interactions or eating and drinking. One of the most common causes of geckos puffing out their head and neck region is to prepare for shedding. By increasing the volume of his head and neck, your gecko can stretch out the old skin, which makes it easier to remove. Within a few days of this behavior's beginning, your gecko may shed. After shedding, most geckos consume their old skin; this is a natural behavior and no cause for concern. When your gecko consumes food or drinks water, you may observe his throat moving up and down, or bulging out a bit. As long as your lizard is not in distress, this is a normal part of the swallowing process. Always feed your gecko insects that are no longer than the space between his eyes, to prevent choking hazards. Some geckos may use throat-puffing behaviors as a response to conspecifics. Associated with both courtship and male-against-male combat, these behaviors are likely to occur only if you keep multiple geckos in a single cage. Tail-waving, push-ups and lateral compression may also accompany the throat expansion. 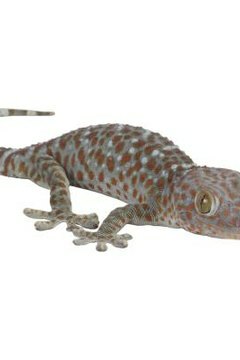 You may see your gecko’s neck and throat area moving in and out ash eh breathes. This is no cause for concern. The amount of movement will vary with his activity level: When he's very active, he requires more oxygen ... and the movement in his neck will increase. Additionally, some herpetologists suggest that the behavior -- technically described as buccal pulsing -- helps the lizards to smell a larger quantity of air. Essentially, it is the gecko’s version of sniffing. If your gecko puffs out his throat, cheeks or jowls, he may have a respiratory infection. Look for bubbles emerging from his mouth or nostrils, which are further indications of such illness. If you suspect that your gecko has a respiratory infection, take him to your veterinarian as soon as possible; review your husbandry practices to prevent the problem from recurring in the future.